Why does one need to perform the extraction on a live system, with the user being logged on? The reason lies in Windows protection mechanisms. While it is technically possible to extract passwords from an offline system or disk image, the required encryption keys are difficult to access and extract if the user is not logged in. In a few moments, a window containing the list of accounts and passwords will be opened. You may review individual passwords or export the list of accounts and passwords into a text file. However, we recommend using the Export Passwords button to create a filtered dictionary of all passwords discovered on the user’s computers. 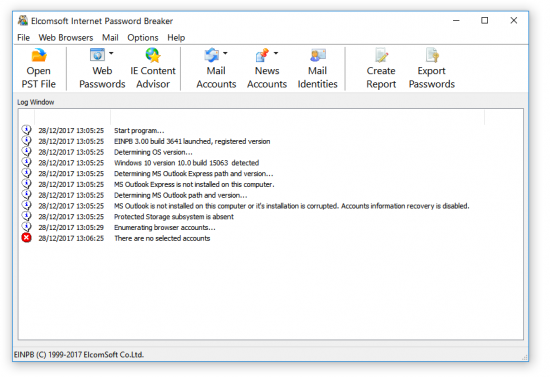 This dictionary may be used to attack other passwords with Elcomsoft Distributed Password Recovery, Advanced Office Password Recovery or other similar tools. You will be prompted for name and location of the text file to contain the passwords. Google collects, stores and processes huge amounts of information. This includes accounts and passwords used in Google Chrome. Passwords are stored in the user’s Google Account and automatically synchronized across devices and Chrome instances that are signed in to the same account. If Two-Factor Authentication is enabled, you will be prompted for a secondary authentication code. 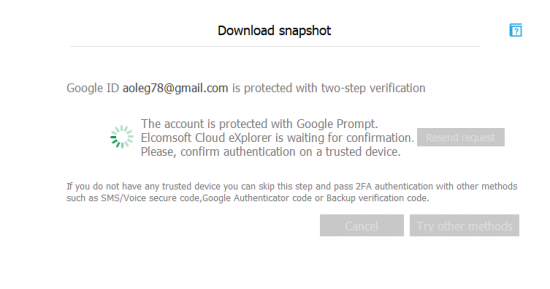 Elcomsoft Cloud Explorer automatically detects the type of two-factor authentication on the user’s account. As an example, if an account is protected with Google Prompt, you will be asked to confirm an interactive prompt on one of the user’s trusted devices. If a trusted device is not available, choose “Try other methods” instead. 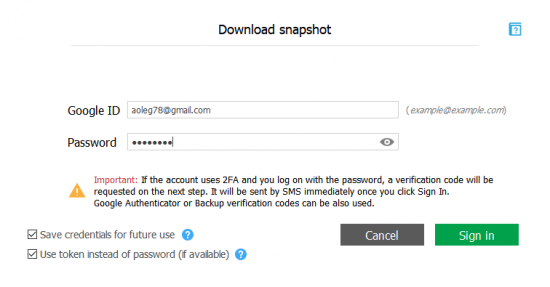 In this case, you will be able to use an 8-digit backup code or a 6-digit TOTP code generated by the Authenticator app. Once the authentication is completed, select Chrome. 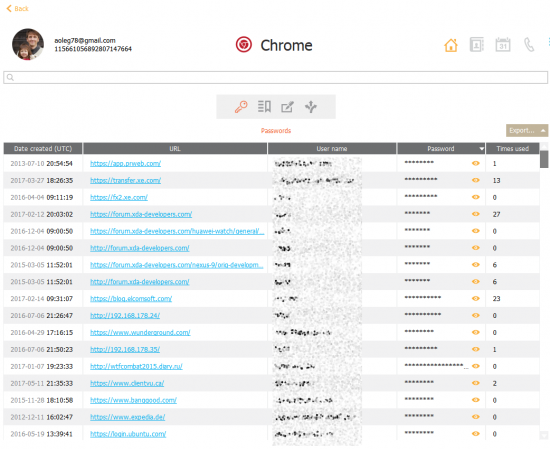 Elcomsoft Cloud Explorer will download Chrome data from the Google Account. 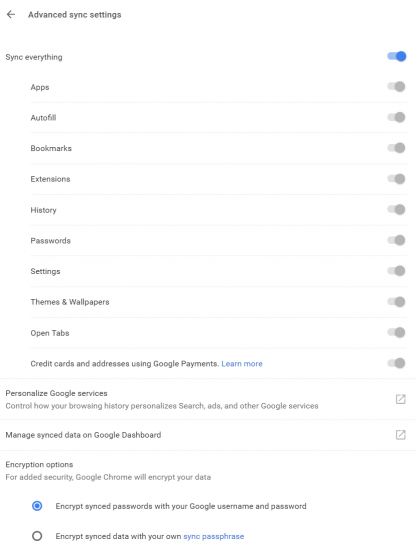 This may take a few minutes depending on the number of data stored in that Google Account. 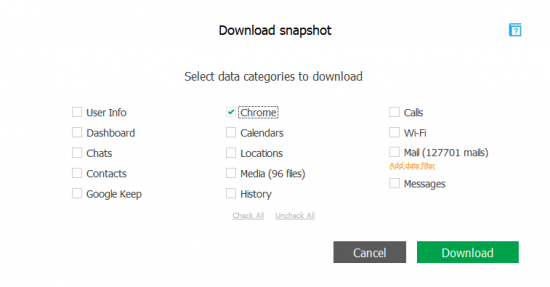 Once the download is finished, you’ll be able to access Chrome data. Click Chrome, and the passwords will be displayed in the window that opens. 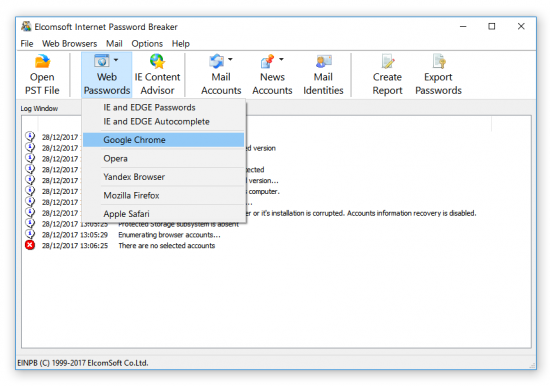 You may use the Export button to export Chrome accounts and passwords into an Excel-compatible spreadsheet. 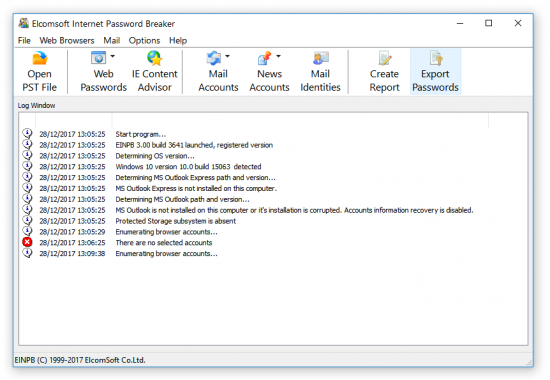 If you need to build a filtered password dictionary for using with Elcomsoft Distributed Password Recovery, you may copy passwords from the Excel spreadsheet, filter out duplicated entries and save them into a text file. If it is this easy to extract passwords from the user’s Google Account, does it mean they are not protected? Not exactly. By default, the data (logins and passwords) is protected with the user’s Google credentials. However, the user may specify their own passphrase to additionally protect passwords. The differences between the two types of protection are described in Google’s documentation. Notably, if the user forgets their passphrase, there is no way to access passwords. Google recommends disabling and re-enabling password sync, which will remove all previously stored passwords from the user’s account. 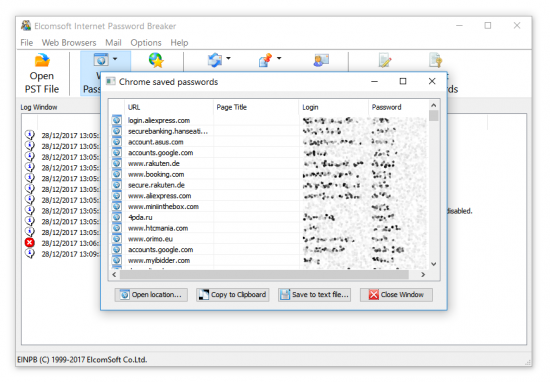 If Elcomsoft Cloud Explorer detects that the passwords are additionally protected with a passphrase, it will prompt for the sync passphrase before downloading the data. Similar to iOS devices, macOS offers a system-wide protected storage for keeping account credentials, passwords and other sensitive information. Among other things, macOS keychain contains passwords used by Google Chrome. By extracting and analysing macOS keychain, experts can gain access to Chrome passwords stored on Mac computers. Similar to Windows, keychain extraction is only possible for the current user during a live system analysis. Note: the trailing dot “ . “ is required as it represents the current folder. The first command copies the main keychain (user keychain). In macOS 11.12 (Sierra) and 11.13 (High Sierra), the file name is “login.keychain-db”. Note: in older versions of macOS the file name is “login.keychain”. In order to decrypt the file, the user’s password will be required. In order to access a keychain database of a user other than the currently logged in one, a sudo command must be entered first. The second command copies the system keychain. This keychain is system-wide, and is the same for all users. This step is optional as the system keychain contains little useful data other than Wi-Fi passwords. In order to decrypt this keychain, a system key is required, which is copied using the next command. The third command copies the system key (sudo and administrative password both required). Step 2. Copy the file(s) to a Windows computer with Elcomsoft Password Digger installed. Step 3. The rest is easy. Launch Elcomsoft Password Digger and specify path to the file(s) you’ve extracted. You will need to specify the user’s password to decrypt the user keychain. Step 4. In a few moments, the keychain will be decrypted. You will then be able to save the entire content of the keychain into an XML file, or create a filtered text dictionary for using with Elcomsoft Distributed Password Recovery or other password recovery tools. You can now access Chrome passwords along with all other passwords stored in the user’s macOS keychain. If you don’t know the correct user password and/or the keychain password, you may recover it with Elcomsoft Distributed Password Recovery. While you may attack either password, note that macOS uses significantly weaker encryption to protect the keychain as opposed to user accounts. As a result, we recommend to always attack the keychain password (as opposed to attacking user account passwords). The speed of recovery for keychain passwords is nearly 100 times faster compared to breaking macOS account passwords. 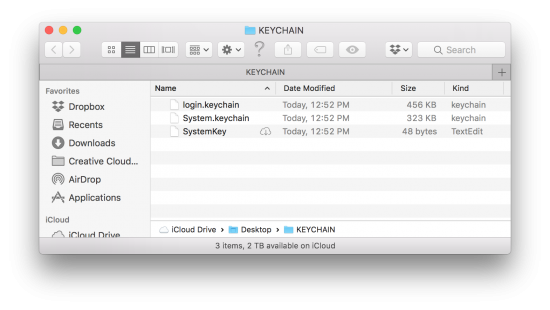 If the Mac is encrypted (FileVault 2), you will need to decrypt the volume before you can copy the keychain database. While you can easily decrypt the volume if you know the user’s login password, you may still need to brute-force that password if it’s unknown. Elcomsoft Distributed Password Recovery supports FileVault 2 passwords. Now that you have the user’s stored passwords, what do you use them for? While accessing the user’s social networks, chats and online shopping accounts may provide essential evidence, we have a few use cases you may have never thought of. By combining the user’s Chrome passwords into a filtered text file (removing duplicates and sorting passwords by the number of accounts they are used with), you are creating the most targeted custom dictionary for attacking the user’s other passwords. You can use this dictionary to attack data protected with strong encryption that would take years (or eternity) to brute-force. You can use this dictionary with Elcomsoft Distributed Password Recovery or similar tools to attack password-protected Microsoft Office documents, ZIP/RAR archives, encrypted volumes, and much more. If all of the conditions listed above are met, the device will begin encrypting the disk immediately after the user logs in with their Microsoft Account credentials (with administrative privileges). The BitLocker recovery key will be automatically (and silently) uploaded into the user’s Microsoft Account. By analysing Chrome passwords, you may be able to obtain the user’s Microsoft Account password. This password may be cached under live.com, hotmail.com, microsoft.com etc. You can then mount or decrypt the encrypted volume by using Elcomsoft Forensic Disk Decryptor. If the user signed in with their Apple ID into any services provided by Apple, you may be able to access their Apple ID password by looking for items such as “icloud.com” or “apple.com” in Chrome passwords. 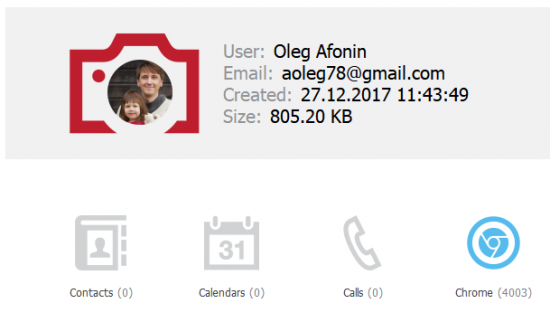 Once you have the user’s Apple ID password, you may be able to use Elcomsoft Phone Breaker to access the user’s iCloud backups, synchronized data such as call logs, calendars and notes, as well as their iCloud Photo Library. If Two-Factor Authentication is enabled, you would still need access to the secondary authentication factor. With Elcomsoft Cloud Explorer, you can extract comprehensive location history, text messages, and a lot more information directly from the user’s Google Account. 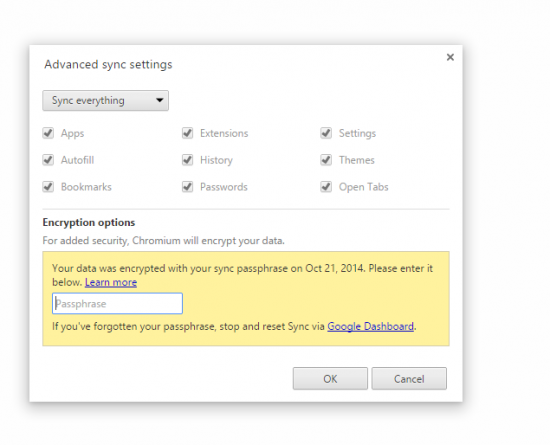 You may be able to retrieve the user’s Google Account passwords by looking for “google” in Chrome passwords. Note: if two-factor authentication is enabled, you will still need access to the secondary authentication factor. This entry was posted on Tuesday, January 9th, 2018 at 2:48 pm	and is filed under Security, Software. You can follow any responses to this entry through the RSS 2.0 feed. Both comments and pings are currently closed.